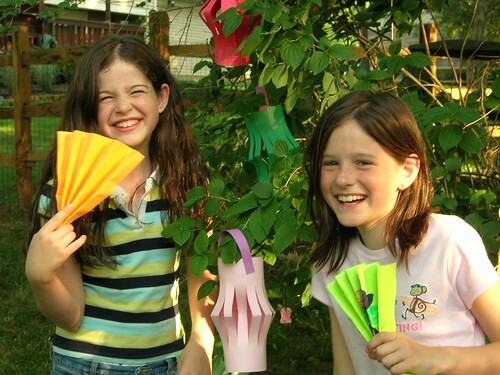 Caitrin and best friend Sarah with handmade lanterns for their Japanese tea party. Have you read the book about the homeschooled kids who built a canoe in the basement, whittling the wood from felled trees? Or what about the teens who figured out how to cross breed fish in their creek, or built eco-friendly low-cost dwellings in their backyard as practice for working with Habitat for Humanity? I remember reading about a kid who played with blocks as a child but then went on to write symphonies in college, after mastering the violin, and learning to conduct a symphony. Somehow these were related. Then there are the kids who’ve read all of the classics and have taught themselves Latin and/or Greek. Others have performed on a Broadway stage, joined a prestigious ballet company, or have tried out to be Olympic athletes. All homeschooled. Other impressive homeschoolers got into Harvard, or wrote best selling fiction (The Inheritance Series, anyone? ), or worked as interns at the state government house! Perhaps your homeschooled children seem “extra” “ordinary” – as in “more ordinary than usual” – to you! I found myself inspired and discouraged at the same time when I’d read about successful older homeschooled kids. I couldn’t see how my brood would ever get there. First of all, we were appallingly bad at science (so scratch cross-breeding and habitat building). We had so many kids, I couldn’t imagine being able to afford supporting a lifetime habit of acting or ballet or singing or violin or lacrosse or gymnastics, let alone accommodating all those rehearsal/practice schedules! And as far as boat-building in basements—I was lucky if we could find the basement floor, let alone make space to build in it. Yet I plugged away with our books and our homeschool parties, our math pages and our co-op, committed to what I could do—how I could make my home a place where creativity had a chance to flourish, and where ambitions were accommodated as best as we could. I couldn’t see the seeds being planted. I couldn’t know how they’d take root. I wasn’t privy to how my children processed our experiences together, and how these memories became anchors of insight that led my kids to aspire to and achieve some of the amazing things they’ve now done. I never saw most of it coming. Truly. On this side of homeschooling, I want to encourage you not to worry about the outcomes. The smallest acts of enthusiasm, support, and opportunity lead to big choices down the road. Your job isn’t to think of the great things your kids can do or should be doing some day. Find that sweet spot each day, no matter how briefly visited. These collect into a childhood of impressions that shape how they will choose to spend their teen years and eventually, their adulthood. They don’t have to “change the world” or impress anyone. All they need is the freedom to keep making choices that enhance their enthusiasm for being contributing people—human beings who want to share who they are with others using their unique constellation of gifts and passions. This entry is filed under Brave Writer Lifestyle, Brave Writer Philosophy, Family Notes, Homeschool Advice. You can follow any responses to this entry through the RSS 2.0 feed. Both comments and pings are currently closed. Yes! What a beautiful remainder. Thank you. I absolutely love this! Thank you for the encouragement!